I grew up watching my mom make homemade bread; she was amazing and made it totally by hand. I can still see her getting out her big metal mixing bowl and worn wooden spoon and then slowly mixing everything together. It looked like a lot of work, but it was always fun to watch. And I loved seeing her gentle hands artfully shape the dough into beautiful, rounded loaves. There was something almost magical about it! But somewhere along the way she stopped making bread, and unfortunately I never learned the art. However, when we got married 7 years ago my husband mentioned that he loved homemade bread. And since I enjoy working in the kitchen and trying new things, I decided to attempt to make some. It’s always good to have a happy husband, right? I’ll admit, it looked rather daunting and I was sure I’d have lots of flops before I actually had any loaves that were decent enough to eat. And there were definitely some batches that were, um, well a bit interesting. But trial and error soon had me producing beautiful, soft loaves and I discovered that bread making is really kind of fun and not all that hard to do once you get the hang of it! I got this bread recipe from my sister-in-law several years ago after eating her homemade bread and being really impressed. Not only is it super simple, it also makes the most delicious bread. My previous recipe was okay but the bread tended to be a bit more dry than this one. And while I appreciate homemade 100% whole wheat bread, I really prefer it to be soft and more flexible like bought bread. This bread is more like that. Since I started making this bread I have eaten more bread than I ever have- it’s just that good! And I absolutely love my Rada bread knife. It does a better job of cutting soft bread than any other knife that I’ve used. I highly recommend it! I was a bit hesitant to post my 100% Whole Wheat Bread recipe since I use a Bosch Mixer and my recipe instructions are written for that. But a number of you were asking for it and really, it should be fairly easy to adapt the directions to make this bread in any mixer or to even knead it by hand, so here it is! One thing that I’ve discovered is that the kind of bread pan that you use really makes a difference in how well your loaves bake. The pans that I use don’t seem to be available online, but I have heard really good things about these USA Aluminized Steel Bread Pans. They actually are almost the exact same size as the pans that I use and look and sound very similar. This recipe is for a Bosch mixer, so the instructions are for that, however, you should easily be able to adapt it to other mixers or simply just knead it by hand. 1. Dissolve yeast in water and pour into mixer bowl. 2. Add all remaining ingredients to mixer bowl. 4. Knead for 5 more minutes. 5. Shape loaves, place in well-greased bread pans and let rise until not quite doubled. 6. Bake at 340 degrees for 22-25 min. * Bosch mixers only have 3 speeds, so speed 1 is low and speed 2 is high. If you use a Kitchen Aid or other mixer, hopefully that will help you know what to turn your mixer to. This bread looks amazing! Unfortunately, the link to "this post about how to make bread" no longer works. I'm new to this and need all the help I can get! :) Also, I am the only one who eats bread in my house, so can the dough be frozen or do all 5-6 loaves need to be baked and eaten asap? Thanks! Kristy, thanks for the heads up about the link. Here's a link with info about bread making that I thought might help you and of course with a quick Google search, you can come up with lots of great info. Bread making sounds intimidating, but it truly isn't that difficult. Basically it just takes a little practice to figure it out. I found the two hardest things being knowing how much extra flour to add and also how to shape my loaves nicely. I don't think I'd try to freeze the bread dough since I'm not sure it would rise right after frozen. But you can most definitely freeze the loaves of baked bread. In fact, you could slice them before you put them in the freezer and then just pull out what you need since homemade bread tends to dry out a bit more quickly than bought bread that is full of preservatives. Hope that helps! two questions: what kind of oil do you use? And where do you buy your lecithin? Where do I find it at the store. Thanks so much. This looks yummy and I want to try it out! Marissa, I usually use canola oil just because it's cheaper but olive oil works well too. In fact, my mom-in-law says her bread is softer when she uses it. We live in an area where there are lots of little Amish run bulk food stores, so I'm kind of spoiled and just buy my lecithin there since it's way cheaper. But you can always buy it at places like Amazon. (here's some powdered lecithin that has good reviews) You can also just skip it and up the amount of wheat gluten too. The last several months that is what I've been doing and it's been working great. I use 3 heaping tablespoonfuls of the wheat gluten and then just don't add any lecithin. Hope that helps! Yes, most definitely! It should work just fine. Do you freeze and thaw this bread later on or do you it all this before it spoils? Looking forward to trying! Hi thanks for the post. When you say you freeze the bread after slicing them up. How do you store them piece by piece without it drying up or get freeze bits on the bread? I read about cling wrap then aluminum foil then freezer bag, is it really necessary to go through so much work? I actually just typically freeze the loaves without slicing them because I find that they stay fresh longer that way. But I have family that prefers slicing them before freezing that way they can pull out just a few slices at a time when they want to use bread. I have never had trouble with the bread drying out in the freezer, but sometimes it will get a bit of iciness on it, especially if the bread was still warm when I packaged it. Usually though I just brush that off when I get it out of the freezer and it's not really an issue. I've never heard of using cling wrap and aluminum foil for wrapping bread. I use some heavy duty bread bags that I get at a local Amish bulk food store. They are nice and thick (sort of like Ziploc freezer bags in weight) and work really well. I looked on Amazon and from what I could tell, these look similar. I wash them and reuse them, so they last me a long time! Hope that helps! 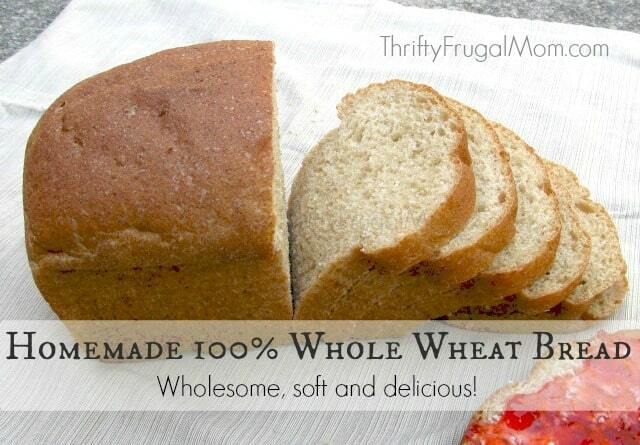 I make homemade wheat bread too!! Yummy. I have not made it with extra gluten. Do you see a difference using it? and where would you buy that? Yes, I do see a difference with the gluten! I feel like it just makes the dough more elastic and creates a more moist, flexible bread. I get mine at a semi-local bulk food store, but I linked above in the recipe to Amazon and some grocery stores may carry it as well.